Synopsis: Working in a Boston homeless shelter, Nick Flynn re-encounters his father, a con man and self-proclaimed poet. Sensing trouble in his own life, Nick wrestles with the notion of reaching out yet again to his dad. Review: One of the most difficult challenges an actor faces is making an unlikable character likable…or at least relatable. In the case of Being Flynn, we have two actors that need to climb that mountain and even if they don’t totally succeed they at least give it their best college try. It’s easy to see what attracted DeNiro to this project. Jonathan Flynn is a complex role that allows the respected actor room to play…and play he does…sometimes to the detriment of the overall character arc. Once DeNiro ventures into the crazier corners of Jonathan’s psyche he lost me a bit as the performance veers awfully close to parody. It’s in Jonathan’s quieter and introspective moments where DeNiro really shines, showing the audience where his obsession originates. I would have liked a little more backstory on how Jonathan came to be but as that’s not really the central focus of the story I can understand the absence. The crux of the plot is seen through the eyes of Jonathan’s equally troubled son and he is brought to nuanced life by Dano. Dano has historically been forgettable to me but here he strikes out with an assured performance showing a maturity and depth absent from previous films. In previous films he has been featured with actors that dwarf him in stature and talent (prime example: his co-star Daniel Day-Lewis in There Will Be Blood) but in Being Flynn he is surrounded with actors that give him room to breathe and explore. At this point in film history, Moore must be classified as The Actors Friend. No matter what role she plays in a film she has the innate ability to make everyone look good just by being present. With her limited amount of screen time she makes a giant impression as the ex-wife/mother of our central Flynns. Seen only in flashback, you may find yourself wishing that another movie was made that focused on her. Director Weitz is comfortable with this father-son material and here he takes it to a darker side. The movie is undeniably hard-edged and gritty…quite cold actually. 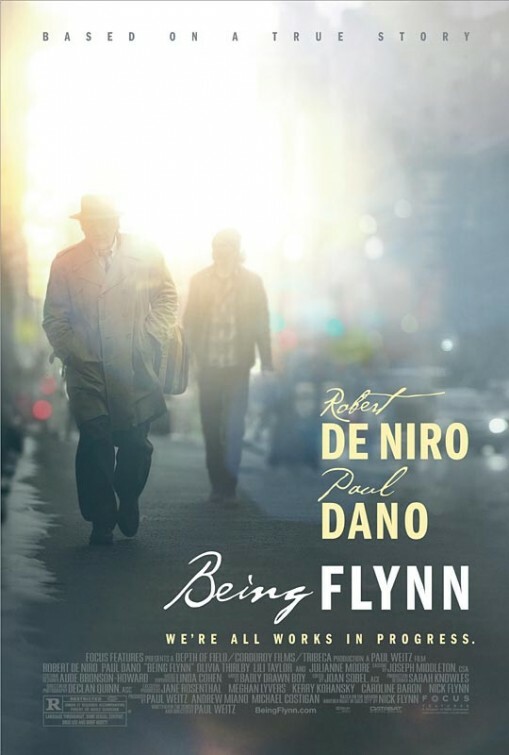 The Flynns fractured relationship is explored with aplomb with no painful stone left unturned. There’s not a lot of lightness in the film so one should enter a viewing of Being Flynn with caution. It’s a film that’s worth your time but not one that you need to rush out to see. Make it a rental and I think you’ll find the value in it.